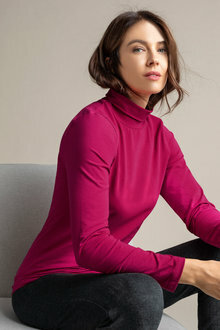 Available in a range of gorgeous winter hues, the Capture Polo Neck Long Sleeve Tee is cut in a simple silhouette, with a roll neck and long sleeves that will keep you warm and stylish throughout the cooler seasons. It's crafted from a cotton and elastane blend, making it breathable, lightweight and easy to care for - perfect for regular wear throughout the seasons. Wear this long sleeved tee as is on those in-between days, and layer it up with jeans, boots and a warm winter coat as the temperature cools.